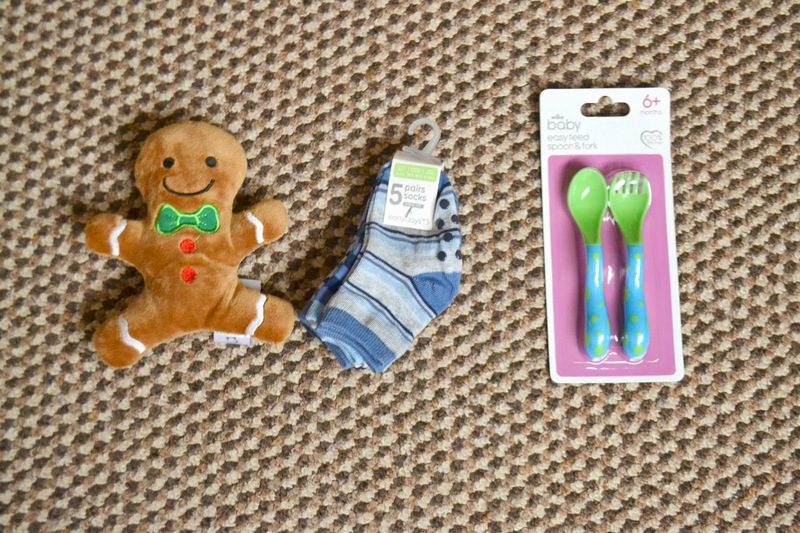 I always find buying smaller gifts for babies hard work. They aren't big enough to have their own interests yet but you still want to get them something. For Paige's first Christmas it was a lot easier. She was 7 months old and crawling, so was into everything. This year I've found it a lot harder for Parker. He will be 6 months old 2 days before Christmas. We already have the majority of toys aimed at 6m+ from Paige's first Christmas so trying to find gifts was actually quite a challenge. 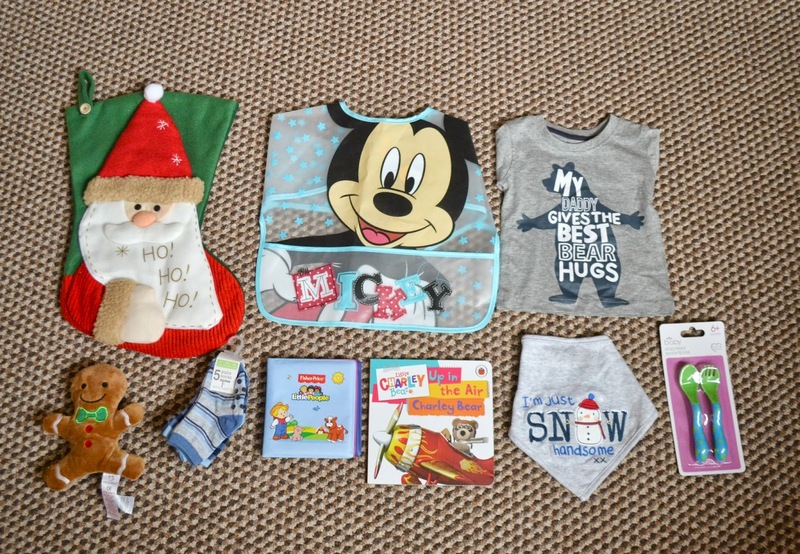 I also find stockings quite a difficult thing but here is what is in Parker's stocking this year. As you can see it's quite basic. After all he will only be 6 months old and won't even be able to open his gifts. I have a feeling his big sister will help a lot! First up are two bibs and a top. 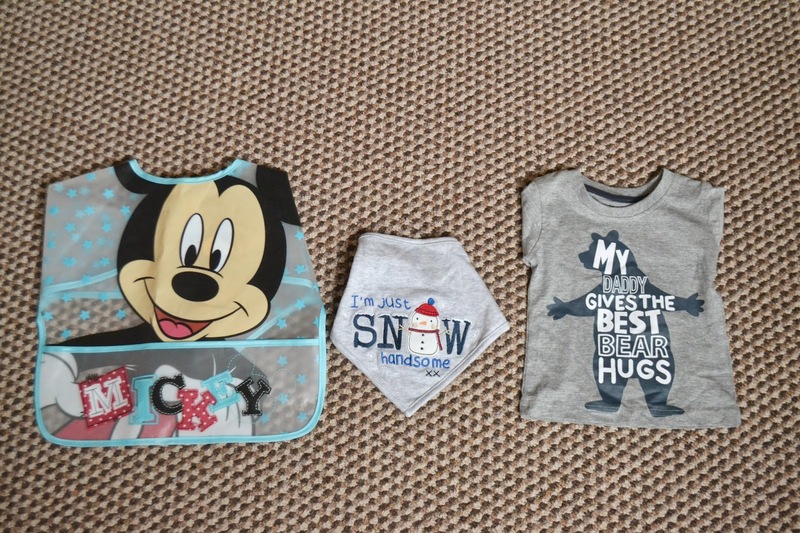 The Mickey Mouse bib will be perfect. We are just starting the weaning process and this bib is wipe able which is a must have in my opinion. It was around £3 from B&M. The next bib is just a fabric dribble bib. It came in a pack of three from George at asda. I think they were around £3.50. I have wrapped the other two up. This top is so cute and it was only £1.50 from good old Primark. Next up we have two books. Both books were £1 from Poundland. 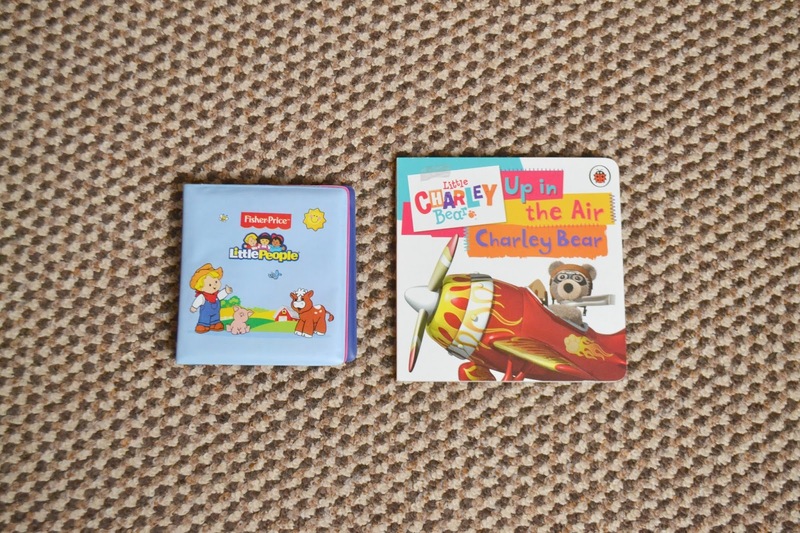 The Fisher Price one is a bath book and the Charlie Bear one is a board book. Both perfect for my little Parker Chops. Lastly we have a gingerbread man teddy. This came in a set from Primark with a dressing gown and some PJ's. The socks are from Primark too and were £2/3 I think. A spoon and a folk... just because Parker doesn't have much weaning things of his own. I can't remember where they were from but they weren't expensive at all. So that is Parkers stocking. It isn't fancy but I am really pleased with the items I got. I decided to stay away from toys as he has quite a few as Christmas presents.